At the Harvard Film Archive’s Conservation Center, we work long days. To keep up morale, we watch the occasional cat film or video. 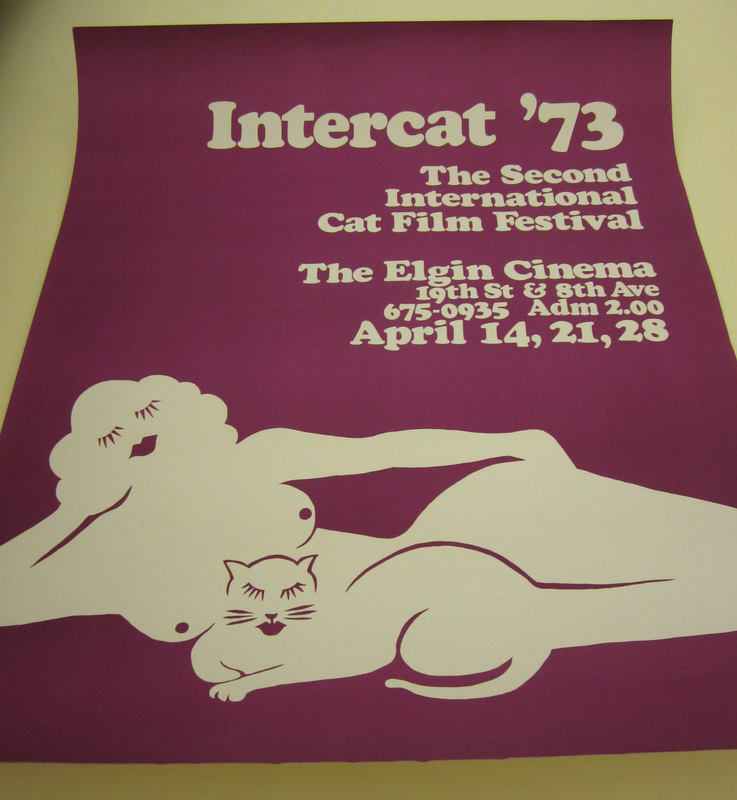 We loved the name, Intercat ’73, as it felt so modern, and because many of our fave cat movies appear on the Internet. Naturally, we thought about hosting our own cat film festival. Then this happened. The Walker Art Center in Mineapolis hosted the first Internet Cat Video Film Festival! We figured they were better equipped than we were for such an event (ten thousand attendees!) and kind of put our dream on the back burner. However, spurred by the recent upload of our new favorite film (more about this later) by our friend and fellow film caretaker Skip at AV GEEKS, we’ve decided do dedicate a corner of the blog to our own festival, which you can watch from the privacy of your phone anytime and anyplace (please, not while you’re in a movie theatre “watching” another movie)! Inspired by the magic of the internets and by the poster above, we’re calling this venture INTERCATNET ’12. We look forward to your suggestions on films to watch and comments on films you’ve seen. Search related posts by clicking on the Intercatnet category at the right. As part of our research, we watched an unusual Czech film on a VHS from Harvard’s library. 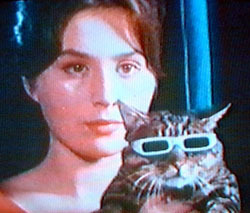 Až přijde kocour or CASSANDRA CAT (Vojtech Jasný, 1963). The VHS copy was poorly dubbed, and I think the film is a little too long, but it’s a pretty crazy children’s fantasy film about traveling circus and a cat that wears sunglasses, which, when removed, turn people different colors that betray their true selves. I hope you enjoyed that one. We have a 35mm print in the HFA’s collection, but it is, sadly, in poor shape. THE THREE LITTLE KITTENS (uncredited, USA, 1938) is a film made for the kindergarten set, and it tells the tale of three little kittens growing up on a farm. Live action with narration, this B&W gem is a real crowd-pleaser. We showed it to some Harvard library staff recently, and most of them had a good time (although one of them was brought back to the frustration of youth – why didn’t *he* get chosen to run the 16mm projector?). So many of our favorite educational films are available on The Internet Archive. While you’re there, have a look around! Click on the photo to watch this heartwarming tale of kittens and how everyone eventually has to make their own way in this world. But what about that film that caused this incredible film festival blog thingy called INTERCAT ’12 to come to fruition? AV Geeks are digitizing 40 miles of their film (approximately 98 hours) collection and putting it up on youtube. This film caught our attention, and is destined to be an HFA favorite, to be viewed on those dark days of winter and those long days of summer whenever the mood strikes. In MOTHER CAT AND HER BABY SKUNKS (produced by Ruth O Bradley, 1958), a mother cat with three kittens adopts three orphaned baby skunks, who are sort of the same size as her kittens. She raises all six in the barnyard, and they get on like gangbusters. This charming tale of acceptance in the face of adversary and the kindness of mother cats is B&W, live action, and narrated by someone who had seen THE THREE LITTLE KITTENS, and is aimed at the same age group (but is completely appropriate for your age, too!). We hope you have enjoyed the movies and will tune in for the next installment of INTERCATNET ’12! This entry was posted in cat movie festival!, Czech film, Intercatnet '12 on September 28, 2012 by conservator1.